These tacos were freaking awesome. I miss the taco truck that used to be in our town and these taste just like them!!! I used chicken breast since that’s what I had in the fridge. DELISH! I had leftover chicken that my husband smoked yesterday. Tonight we made these …OMG! The family said best tacos ever! They were fabulous. The right amount of heat for me and so flavorful and fresh! Thanks for sharing! Absolutely the best ever!!! I will never make these any other way!! Thank you!!! You are hilarious! And these are delicious, thank you! If it’s covered, that’s not roasting. Roasting is done with dry heat cooking the surface of the food, and covering it traps steam. So, apparently you didn’t know that? It’s very basic culinary knowledge, I’m afraid. “Roasting and baking are forms of dry-heat cooking that use hot, dry air to cook food. Like other dry-heat cooking methods, roasting and baking brown the surface of the food, which in turn develops complex flavors and aromas. Both words describe a method of cooking an item by enveloping it in hot, dry air, generally inside an oven and at temperatures of at least 300°F and often much hotter. A convection oven, which circulates hot air throughout the oven, can enhance the browning reaction. Roasting and baking both require that the food is cooked uncovered, so that it’s the hot, dry air that delivers the heat, not steam from the food. It’s not the meat, nor is it the way the meat will be used that is the issue. It is the misuse of correct terminology that is problematic. Really. Can you make the cream a day in advance? The idea of shredding the chicken with a mixer is AMAZING! These are officiate my favorite tacos. 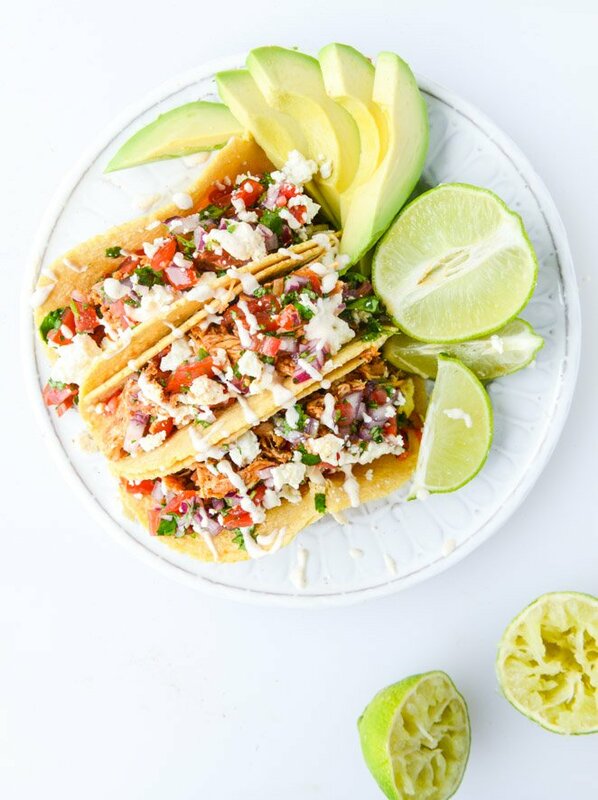 Using chicken thighs and mixing the chicken back into the juices makes these tacos so juicy and flavorful.. i also love the creama. Thank you so much for this! Meant to give it 5 stars.. I just made these tonight, they were fantastic, I followed your recipe exactly and I will forever be making these!! So easy, fast and super delicious!! Stupid wordy blog! Just give us the recipe already! This might be a fun thing to do if you are a stay at home mom that has all the time in the world to worry about dinner, but being a widower father (and most single moms and dads will agree with me) we don’t really have the time to work 70 hours a week and try and worry about what’s for dinner! Just get to the point already and stop worrying about trying to get more followers (meaning show the recipe and then tell me how to cook it and then add all your bullsh** later!) Waste of my time and I guess we are ordering out again! i am not a stay at home mom. this is A BLOG. this is not a recipe website. the recipe is posted at the bottom and you are welcome to scroll down. i’m not doing anything to get more followers. i’ve done this for 9 years. Brian, your stupid wordy rant was too long so tldr; but it looks like you need a hobby. It was worth the calories i burned scrolling down. (though I admit, I did cut some corners and made it even simpler-salsa out of the jar when I had no time for the “real stuff” ) Some days, you just gotta lower your standards. Tonight is one of them. The time in the world’- who is that? I’d love to meet her. Wow you are a horribly rude person, all you had to do was scroll to the bottom for the recipe. I am going to choose to put this off as something you said after having a really bad day, I truly hope this is not the person you are. My taco world has been changed forever!! Thank you so much for posting this! I followed everything exactly except I used adobo powder in the sauce. I have now made this 20 times, I feel like I should say something. Avocado on the side forever. Hello! Do you think using thighs instead of breasts greatly influences the end product? Thank you! My husband only likes white meat so I’ve made this recipe a dozen times using breasts…it’s still fantastic! So so delicious!! I just cooked them with chicken breasts because that’s what I had in the fridge and it came out perfect!! I just cooked in the oven a little longer. We love these! I used my machine yokey once because I HATE shredding chicken and ended up with powder, even then, still delicious! Thanks for posting, I’d be lost in dinner ruts for ever if it weren’t for the wide array of online recipes!! Great recipe! I thought it was funny when you used the word moist, then said there isn’t another word to be used here. Not sure why people hate that word so much. HA! I’m planning a large party so do you think that the chicken could be cooked in advanced and frozen without drying out? Also, what’s your thoughts on mixing breast and thighs? i absolutely do! and i’ve had it in the freezer with success. you can for sure mix breasts and thighs. i would add some chicken stock when freezing and reheat it on the stovetop or in a slow cooker with even more stock so it’s juicy! Just made this for the first time. A BIG hit with the family. Would definitely recommend this recipe as-is, and I look forward to making it many, many more times and the experimenting with the variations that are to be had. Thank you for posting!!! We made this last night for our taco night. We changed the heat aspects because we don’t like spicy and made a homemade guac to add to the tacos with the greek lime yogurt sauce. I seasoned the chicken before while it was browning and then after baking and shredding , reseasoned it and mixed it together on the stove. It was delicious!! 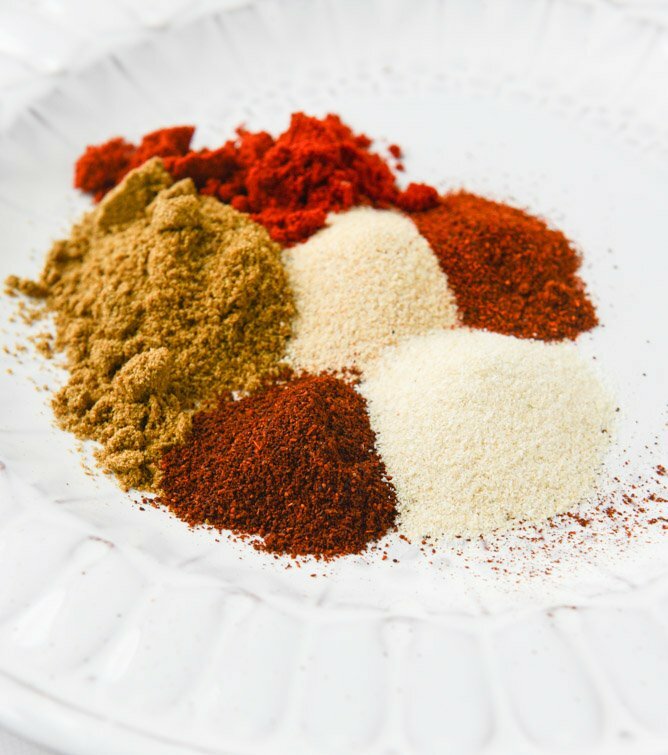 I absolutely love cumin and so that robust flavor was great. 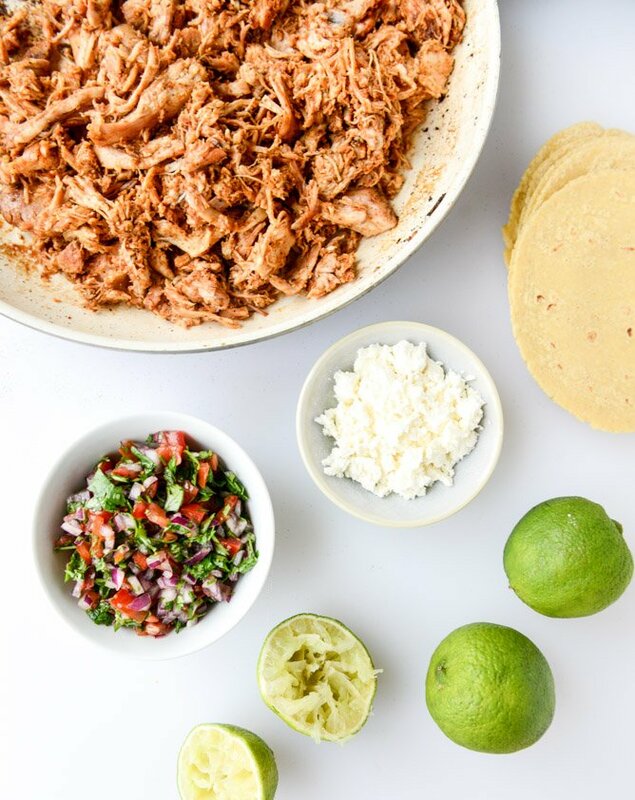 This is now going to be my go to chicken taco recipe. Thank you!! FOllowed even recipeexactly and it was so good. My picky kids loved it. I did have to make the Adobe sauce twice because I question the 3/4 cup of half n half. That portion made soup. I had to dial down the half n half by a lot. But I don’t even care.. it was so dang good. 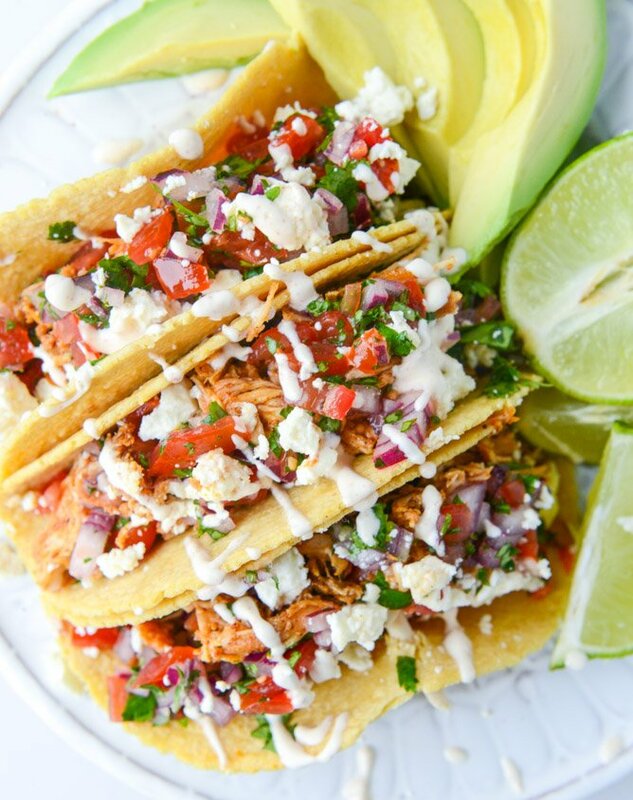 I made these tacos and my boyfriend absolutely loved them! He’s a finicky eater but he said this was by far his favorite meal I’ve made him over the years. Thank you so much! I wanted to make this tonight but I don’t have a skillet with a top that I can stick in the oven. What can I use? Also how can I make less spicy for my kids? I used a glass casserole dish and covered it with foil. Chicken came out great! AMAZING!!!!!!!! 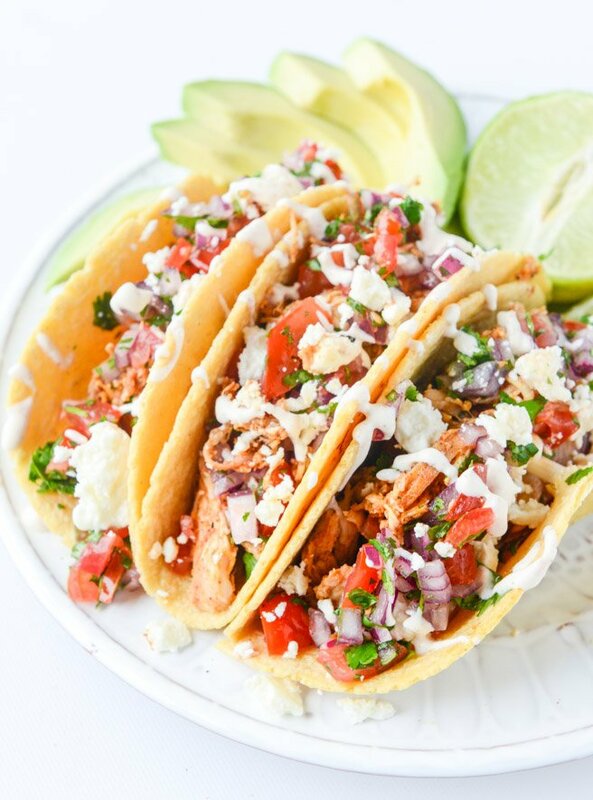 healthy, flavorful, delicious and quick!! My husband and I loved it. Thank you for sharing!!! Thanks for taking the time to share this great recipe! Have you ever really, really wanted to make a recipe, but lacked the ingredients, and didn’t want to go to the grocery store at 5PM? Well, that was me tonight. I made a lot of changes, and these still came out great. I used chicken breasts. Did not have red onion, and feared a yellow might be too strong, so I roasted the onion and tomatoes and threw in some dried cilantro; that made a very good salsa. Had only nonfat regular yogurt and thinned it a bit with skim milk. Had to use bottled lime juice. Did not have the queso fresco, so I used Monterey Jack. I did at least have all the seasonings called for. Despite all m substitutions, they were still very, very good tacos. SUPER DELICIOUS! The spice mix was amazing as well, and even though I didn’t have all the ingredients, it worked out fabulously. Will use again! These were so good.. I was a little skeptical about baking them in the oven. They were very tender and juicy upon coming out of the oven. The second thing I was skeptical of was putting them in the mixer. That was genius. It shredded them nicely and the spices were evenly distributed. Now we can get down to the taste. Delicious. I’ll definitely be making them again. 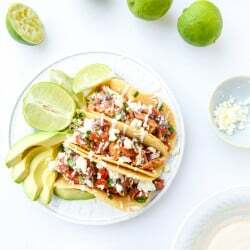 These tacos were absolutely DELICIOUS! My son was home from his tour of duty and visiting. When I told him I make some tacos from a new recipe I found online, he wasn’t too excited. When I served them he said they were the best tacos he ever had! My husband loved these too. He quit eating my tacos because I used a seasoning mix and thought they were horrible. I made these and he said he’d give it 10 STARS. Hi this looks like a great recipe. I’m probably going to make it tomorrow night but is it ok to cook the chicken thighs on the bone then pick it off just before hand mixing? will that work? Also are there any substitutes that i can use for half and half because we don’t get it here in Bulgaria. 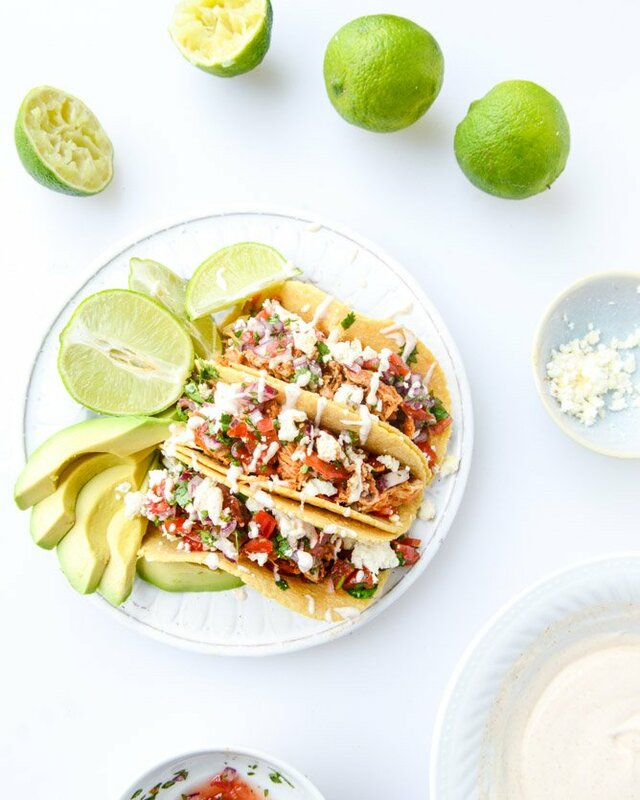 I know this post is super old since Max is practically a teenager now, but I got married about 2 months ago and my husband and I instituted Taco Tuesday religiously and I love that you have a whole section on your blog dedicated to tacos because after 8 Taco Tuesdays I am desperately in the need for fresh ideas. And working full time, only getting home at 8pm on an average night, I need recipes that can be on the table in under 45 minutes so boneless, skinless chicken thighs are a god send. And I completely agree with you… recipes in a slow cooker always end up tasting sort of like a slow cooker and so I am glad that despite my “no time at night” I have managed to avoid slow cooker meals (in spite of the advice I get from every single person I know–I guess my palette is just too refined ;-P). Please keep your quick weeknight dinner recipes coming!! This recipe, as posted, is beyond words amazing!! I honestly can’t wait to have leftovers. It was RIDICULOUSLY good!! The la Crema was wonderful. I HIGHLY recommend!! All members of my family (age 45 thru 10) LOVED it!! Will be a regular on our menu!!! I have made these probably 25 times now. I do one 1.5lb package of thighs with one 1.5lb package of breast meat mixed together and I freeze half so I only have to make it every ten days or so. I eat this meat every morning over brown rice with an egg on top. Cannot recommend this enough. I also batch this out for my friends who have babies and they love it. I made this recipe for work; I doubled all the ingredients and left in my slow cooker to cook overnight…. OMG!! Delicious! The salsa is a great final touch. Will be making this recipe again! Super yummy!